Measurements: 2.75 x 5.05 inches; or 70 x 128 millimeters. Back of card: Yellowish with gray border. A big eye stars out from the center. Not to be inverted, that eye will bother you if you do. Booklet included: Yes, small, 23 pages, 2.65 x 5 inches, or 67 x 126 mm. Text is based on the work of Rachel Pollack but so compressed as to be run-of-the-mill. Comments: I should cheat & tell you what it says on the sides of the boxes. On one side of this box, "....draws upon many esoteric & religious traditions, particularly Native American, the Holy Grail, the I Ching, Kabbalah & the Runes." 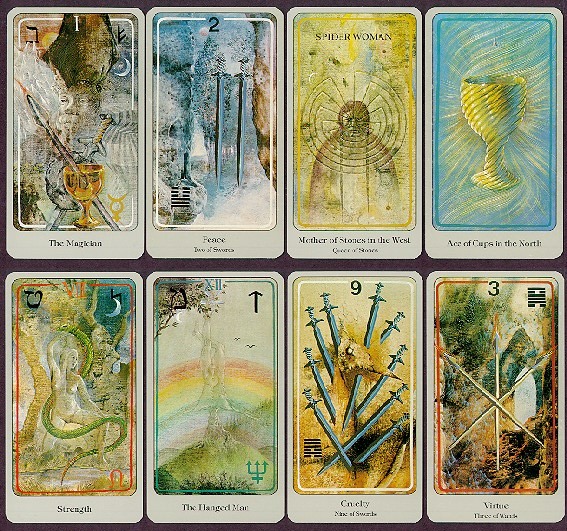 The other side says, "Swords represent air, the south & Egypt [traditionally Swords represent the cold dark north]; wands are fire, the east & India; cups are water, the north & Europe [water freezes in the north]; stones are earth, the west & America." Just to show you the sort of blurbs they put on the back of books, or on tarot boxes. Note the pip cards are devoid of much obvious symbolism. The Ace of Cups reminds me of Babbitt's Atom (see it on page 13 of Manly Hall's Secret Teachings of All Ages). This was a carefully and minutely drawn heart-shaped image of the ultimate particle of matter/energy. Drawn originally in the late 19th century, was later confirmed by C.W. Leadbeater. This hasn't anything really to do with the cards, it's just an example of what comes to mind, or should come to mind from one's private experience. The cards are more than cards, they're also what you bring to them. Notice in the major arkana the Hebrew letter in upper left, rune in the upper right, zodiac symbol in the lower right. On the pip cards, note the I Ching symbol, generally in one of the upper corners, though occasionally in one of the lower corners, as well as the keyword at the bottom.